Seismic refraction and gravity-based crustal thickness estimates of the Ontong Java oceanic plateau, the Earth's largest igneous province, differ by as much as 18 km. In an attempt to reconcile this difference we have evaluated available seismic velocity data and developed a layered crustal model which includes (1) a linear increase in velocity with depth in the Cenozoic sediments and the uppermost extrusive basement and (2) a reinterpretation of deep crustal and Moho arrivals in some deep refraction profiles. Previously, Moho had commonly been interpreted from later arrivals and in some cases constrained by precritical arrivals. However, if first arrivals at distal offsets are interpreted as Moho refractions, the maximum depth to Moho is reduced by about 10 km. 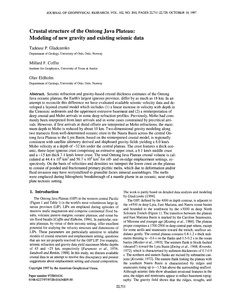 Two-dimensional gravity modeling along two transects from well-determined oceanic crust in the Nauru Basin across the central On-tong Java Plateau to the Lyra Basin, based on the reinterpreted crustal model, is regionally consistent with satellite altimetry derived and shipboard gravity fields yielding a 8.0 km/s Moho velocity at a depth of бн32 km under the central plateau. The crust features a thick oceanic, three-layer igneous crust comprising an extrusive upper crust, a 6.1 km/s middle crust and a бн15 km thick 7.1 km/s lower crust. The total Ontong Java Plateau crustal volume is calculated at 44.4 б┐ 106 km3 and 56.7 б┐ 106 km3 for off- and on-ridge emplacement settings, respectively. On the basis of velocities and densities we interpret the lower crust on the plateau to consist of ponded and fractionated primary picritic melts, which due to deformation and/or fluid invasion may have recrystallized to granulite facies mineral assemblages. The melts were emplaced during lithospheric breakthrough of a mantle plume in an oceanic, near-ridge plate tectonic setting.